Azathioprine (AZA) is used in the treatment of patients with refractory inflammatory bowel disease; however, its use is limited because of systemic toxicity associated with long-term use. Ileocecal delivery of AZA might be advantageous if local intestinal therapeutic effects could be provided with decreased systemic side effects. Decreased cecal systemic absorption would allow higher dosages of AZA to be administered. 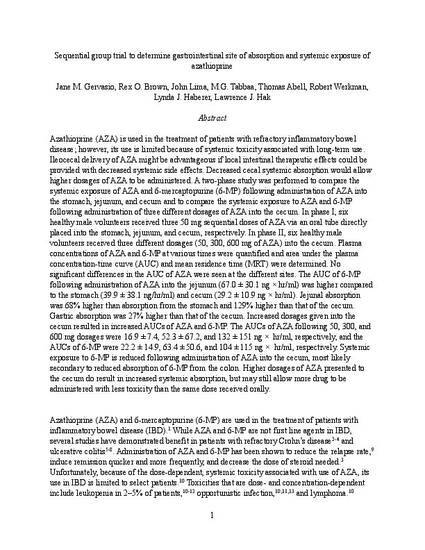 A two-phase study was performed to compare the systemic exposure of AZA and 6-mercaptopurine (6-MP) following administration of AZA into the stomach, jejunum, and cecum and to compare the systemic exposure to AZA and 6-MP following administration of three different dosages of AZA into the cecum. In phase I, six healthy male volunteers received three 50 mg sequential doses of AZA via an oral tube directly placed into the stomach, jejunum, and cecum, respectively. In phase II, six healthy male volunteers received three different dosages (50, 300, 600 mg of AZA) into the cecum. Plasma concentrations of AZA and 6-MP at various times were quantified and area under the plasma concentration-time curve (AUC) and mean residence time (MRT) were determined. No significant differences in the AUC of AZA were seen at the different sites. The AUC of 6-MP following administration of AZA into the jejunum (67.0 ± 30.1 ng × hr/ml) was higher compared to the stomach (39.9 ± 38.1 ng/hr/ml) and cecum (29.2 ± 10.9 ng × hr/ml). Jejunal absorption was 68% higher than absorption from the stomach and 129% higher than that of the cecum. Gastric absorption was 27% higher than that of the cecum. Increased dosages given into the cecum resulted in increased AUCs of AZA and 6-MP. The AUCs of AZA following 50, 300, and 600 mg dosages were 16.9 ± 7.4, 52.3 ± 67.2, and 132 ± 151 ng × hr/ml, respectively, and the AUCs of 6-MP were 22.2 ± 14.9, 63.4 ± 50.6, and 104 ± 115 ng × hr/ml, respectively. Systemic exposure to 6-MP is reduced following administration of AZA into the cecum, most likely secondary to reduced absorption of 6-MP from the colon. Higher dosages of AZA presented to the cecum do result in increased systemic absorption, but may still allow more drug to be administered with less toxicity than the same dose received orally. “The final publication is available at Springer via http://dx.doi.org/10.1023/A:1005573229786”.